George Billis Gallery is pleased to present the gallery’s first solo exhibition of paintings by Northern California based artist Kim Squaglia. The exhibition features the artist’s most recent body of work and continues through July 6th. 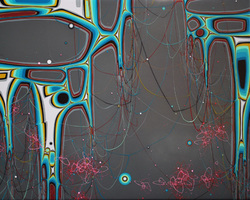 Squaglia's paintings consist of multiple layers of delicately rendered biomorphic patterns layered between coats of resin. She builds on each surface with areas of saturated fields and lines of color. The imagery references the forms and space of biology, now transformed into delicate web-like trendrils within a murky atmosphere. The overall effect is the impression of ambiguous yet effective spatial depth and movement. Kim Squaglia received her MFA in paintings from The University of Texas San Antonio in 2000. She participated in an Artist in Residence program at Skowhegan School or Painting & Sculpture, ME. She received multiple grants and awards including the International Study Abroad to Berlin, Travel Grant, and The ArtPace Foundation – travel grant. Some of her collectors include Neiman Marcus, Microsoft, Captial One Bank and the U.S. State Department.